Dr. Maria Stefan has over 20 years of experience in dentistry. She has achieved a very succesful career with comprehensive technical knowledge of new dental equipment and techniques. She will make sure that you get the best dental service possible. Dr. Stefan is a graduate of the University of Medicine and Pharmacy in Bucharest, Romania where she received her Doctor of Dental Surgery Degree in 1994. Before coming to Stockton Dr. Stefan has been in practice for several years in Seattle, Washington. For your convenience Dr. Stefan is bilingual, she speaks English and Romanian. Jessica is a Dental Assistant. She works at the Front Office. 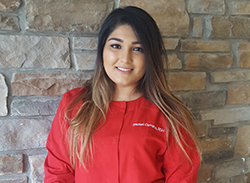 She has been in the dental field and with our team for over 5 years. She is fluent in Spanish. She is very friendly and always glad to assist you in scheduling appointments. We, as well as our patients, are very fortunate to have her on our team. 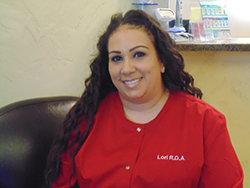 Lori has been in the dental field over 11 years and with our office for most of those years. 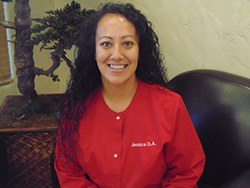 She is our back office Registered Dental Assistant who is very compassionate about her job. We are happy to have Lori in our office family and caring for our patients. Lori takes pride in helping the doctor and patients with anything needed so don�t hesitate to ask her any questions you have! Ashley has been with our practice for over 8 years, you will see her assisting the doctor, taking x-rays, sitting and greeting our patients. When she is not assisting in the back Ashley can be found helping out in the front, she has been a great fit for our office and we all enjoy working with her. Stefani is a returning member of our dental team; she was a part of our dental family a few years ago and left to finish dental hygiene school. Our office is delighted to have her back on our team! Prior to becoming a Hygienist she was a dental assistant so she has many years of experience in the dental field. Stefani graduated from The Taft College Dental Hygiene Program in 2016. Stefani takes pride and enjoys working as a Dental Hygienist. She is compassionate, gentle, thorough, and her main focus is meeting each person's individual hygiene needs. She looks forward to becoming your dental Hygienist!